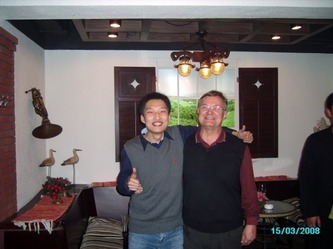 As the first customer ordering my service, Rob, from UK, is still a university student and quite independent in contrast to those being educated in Chinese university campuses. In order to push ahead a research project on sustainable architecture, Rob alone stepped into a land he only has knowledge obtained from the book. Interacting with him, I began to have a full picture of sustainable architecture and how it works to make the world more green. During the trip, there is one thing I\'d like to share with other foreigners who like to travel in China. At end of the trip with Rob and before driving back, we were called a halt by a local authority officer who is in charge of the place we visited and asked for presence of related materials to prove your identity, as it is a sensitive matter if foreigners try to photograph and interview with locals. So, as this case tells, if you try to travel yourself in China without evil plans, please have everything identifiable for your trip in place in order to keep from avoidable troubles. Those materials include ID card, Passport, invitation letters, student card, work card, and business cards. Good luck for your trip!